Instead of being one of those people who draws your attention to the fact that I'm a lazy bum who hasn't posted in...forever...let me just say that I've been out of town for...almost forever. And, let me show you this cool geezer cane that I've dubbed "Portlandia Stick." (Thank you Debs Pouliot, for that.) Portlandia stick was loaded with all manner of amazing metal emblems. I say "was" because, of course, I've stripped it clean so I can use those snazzy little metal plates, in found object jewelry. I originally thought it was a geezer stick belonging to, let's just say, an older gentleman, who traveled Europe, extensively. The plates seem to be in French...or some such. But, it's been called to my attention that this may have been some sort of boy scout hiking stick. Either way, it's clear of medallions at this time. Btw...you may have guessed, I've been to my homeland: Portland, Oregon. Yep, Portlandia is alive and well and, never fear, still weird. Which brings me to this special announcement. Well, not the weird part, but the found object part. 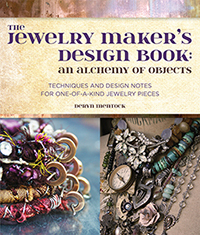 I'll be offering The Alchemy of Objects as my next online class! I'm so excited because I've only offered this workshop one other time...and it was a blast! This is a really different class because you all get to do jewelry design challenges...and I get to critique them. So much fun! Registration will begin Sept. 21, 2015 and Alchemy will run Oct. 2 through Dec. 6, 2015. Click right here, for all the details and loads more photos.